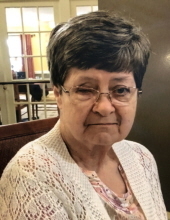 Betty Jean Bissette, 72, previously of Chesapeake, passed away peacefully on Tuesday, April 9, 2019 in Seville, Ohio. Mrs. Bissette was born in Richmond, VA, the daughter of the late Raymond and Mary Katheryn “Kat” Beyke. She was predeceased by her husband, Garland “Pete” Bissette, and a brother, Thomas Beyke. Survivors include her daughter, Karen Denise Davis; two granddaughters, Riley Tate and Erin Mae Davis; a step-daughter, Catherine Murphy; a sister, Shirley Drager; as well a numerous nieces, nephews, great-nieces and nephews. Friends are welcome to view and sign the guest book from 12:00 noon to 8:00 p.m., Monday at Oman Funeral Home & Crematory, Chesapeake. To send flowers or a remembrance gift to the family of Betty Jean Bissette, please visit our Tribute Store. "Email Address" would like to share the life celebration of Betty Jean Bissette. Click on the "link" to go to share a favorite memory or leave a condolence message for the family.